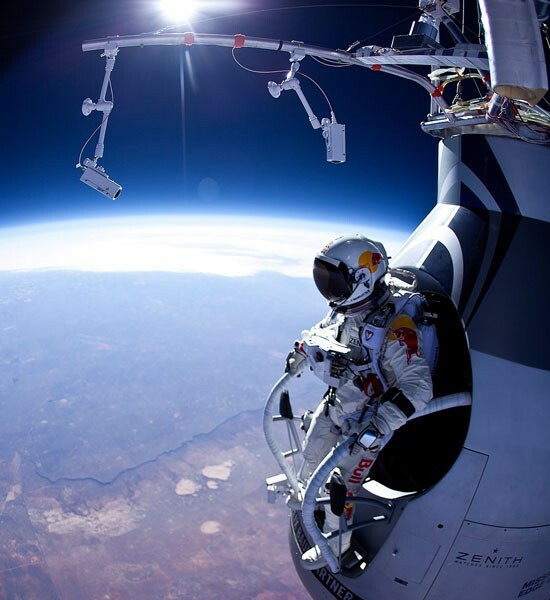 On Sunday, daredevil skydiver, Felix Baumgartner finally was able to make his "edge of space" jump. (The operation had been postponed several times previously, due to the winds.) In a word, the jump was AMAZING. I consider myself to be a bit of a thrill-seeker, rarely shying away from roller coasters or any other pulse-pounding opportunity. However, I don't know if I would've had the colossal gonads to do what Felix did. I felt queasy, just watching the video as he leaned over and leapt from his tiny vessel, to complete the highest freefall in history--a whopping 128,000 feet--approximately 24 miles. Felix tweeted after the event, "I could feel myself break the speed of sound. I could feel the air building up and then I hit it." Check out the video of the jump.